Is an autosomal recessive disorder affecting the exocrine glands, in which their secretions become abnormally viscous and liable to obstruct glandular ducts. It primarily affects pulmonary and GI function. The average life expectancy for the cystic fibrosis patient is currently age 30 to 40. Death may occur because of respiratory infection and failure. Other complications include esophageal varices, diabetes, chronic sinusitis, pancreatitis, rectal polyps, intussusceptions, growth retardation, and infertility. The responsible gene,the CF transmembrane conductance regulator (CFTR),is mapped to chromosome 7 (see Genetic Considerations). The underlying defect of this autosomal recessive condition involves a defective protein that interferes with chloride transport, which, in turn, makes the body’s secretions very thick and tenacious. The ducts of the exocrine glands subsequently become obstructed. Usually present before age 6 months but severity varies and may present later. Meconium ileus is found in neonate. Usually present with respiratory symptoms, chronic cough, and wheezing. Parents may report salty taste when skin is kissed. Failure to gain weight or grow in the presence of a good appetite. Frequent, bulky, and foul smelling stools (steatorrhea), excessive flatus, pancreatitis and obstructive jaundice may occur. Protuberant abdomen, pot belly, wasted buttocks. Clubbing of fingers in older child. Increased anteroposterior chest diameter (barrel chest). Hyperglycemia, glucosuria with polyuria, and weight loss. Sweat chloride test measures sodium and chloride level in sweat. Chloride level of more than 60 mEq/L is virtually diagnostic. Chloride level of 40 to 60 mEq/L is borderline and should be repeated. Duodenal secretions: low trypsin concentration is virtually diagnostic. Reduced trypsin and chymotrypsin levels-used for initial screening for cystic fibrosis. BMC ( Boehringer-Mannheim Corp.) meconium strip test for stool includes lactose and protein content; used for screening. Chest X-ray may be normal initially; later shows increased areas of infection, overinflation, bronchial thickening and plugging, atelectasis, and fibrosis. Pulmonary function studies (after age 4) show decreased vital capacity and flow rates and increased residual volume or increased total lung capacity. 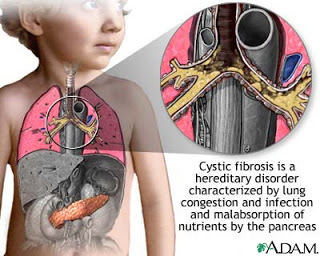 Positive family history of cystic fibrosis. Typical chronic obstructive lung disease. Genetic screening may be done for affected families. Antimicrobial therapy as indicated for pulmonary infection. Oral or I.V. antibiotics as required. Inhaled antibiotics, such as gentamicin or tobramycin, may be used for severe lung disease or colonization of organisms. Bronchodilators to increase airway size and assist in mucus clearance. Pulmozyme recombinant human DNase (an enzyme) administered via nebulization to decrease viscosity of secretions. Pancreatic enzyme supplements with each feeding. Occasionally, antacid is helpful to improve tolerance of enzymes. Favorable response to enzymes is based on tolerance of fatty foods, decreased stool frequency, absence of steatorrhea, improved appetite, and lack of abdominal pain. Gene therapy, in which recombinant DNA containing a corrected gene sequence is introduced into the diseased lung tissue by nebulization, is in clinical trials. Monitor weight at least weekly to assess effectiveness of nutritional interventions. Monitor respiratory status and sputum production, to evaluate response to respiratory care measures. To promote airway clearance, employ intermittent aerosol therapy three to four times per day when the child is symptomatic. Perform chest physical therapy three to four times per day after aerosol therapy. Help the child to relax to cough more easily after postural drainage. Suction the infant or young child when necessary, if not able to cough. Teach the child breathing exercises using pursed lips to increase duration of exhalation. Provide good skin care and position changes to prevent skin breakdown in malnourished child. Provide frequent mouth care to reduce chances of infection because mucus is present. Restrict contact with people with respiratory infection. Encourage diet composed of foods high in calories and protein and moderate to high in fat because absorption of food is incomplete. Administer fat-soluble vitamins, as prescribed, to counteract malabsorption. Increase salt intake during hot weather, fever, or excessive exercise to prevent sodium depletion and cardiovascular compromise. To prevent vomiting, allow ample time for feeding because of irritability if not feeling well and coughing. Encourage regular exercise and activity to foster sense of accomplishments and independence and improve pulmonary function. Provide opportunities for parents to learn all aspects of care for the child. Teach the parents about dietary regimen and special need for calories, fat, and vitamins. Discuss need for salt replacement, especially on hot summer days or when fever, vomiting, and diarrhea occur. Teach the patient and family how to prevent future episodes of pneumonia through CPT,expectoration of sputum, and avoidance of peers with common colds and nasopharyngitis. Explain that medications need to be taken at the time of each meal, especially pancreatic enzymes and supplemental vitamins. Teach the parents protocols for home IV care, as needed. Teach parents when to contact the physician:when temperature is elevated over 100.5°F, sputum has color to it, or the child complains of increased lung congestion or abdominal pain. Also educate parents on the need to keep routine follow-up appointments for medication,laboratory, and general checkups. Teach the patient or parents proper insulin administration and the appropriate signs and symptoms of high and low glucose levels. Ineffective airway clearance related to thick mucus secretions and effort and a lot of bad cough. Shows an effective cough and increased air exchange in the lungs. Auscultation of breath sounds. Note the example of wheezing breath sounds, crackles, rhonchi. Rationale: Some degree of spasm of the bronchial obstruction with airway obstruction and may / not indicated the presence of abnormal breath sounds or crackles eg absence of breath sounds. Perform physiotherapy to issue secret and give the patient a comfortable position, eg, elevation of the head of the bed, sitting on the back of the bed (position semi-Fowler / Fowler). Rationale: head of bed elevation facilitate respiratory function using gravity. Assist clients to dilute sputum, with the collaboration expectorant administration to improve airway clearance. Rationale: Giving expectorants may help thin the secret, that secret is more easily removed. Provide nebulizer with a solution and in accordance with the right tools. Rationale: Nebulization can help spending viscous secretions. Observations clients closely after aerosol therapy and chest physiotherapy to preventaspiration due to many sputum suddenly become watery. Provide postural drainage (adjust the area where there is a buildup of mucus) as prescribed to reduce the viscosity of mucus. Rationale: Postural drainage aids in the excretion of mucus is thick. Impaired gas exchange related to airway obstruction by nasal obstruction. Goal: Maintaining adequate oxygenation or ventilation. The patient showed respiratory rate effectively. Arterial blood gas within the normal range. Rationale: Preventing complications of respiratory failure. Position the patient to obtain maximum efficiency ventilators, such as a high Fowler’s position or sitting, leaning forward. Rationale: Position Fowler / semi-Fowler can facilitate respiratory function and can reduce airway collapse, dyspnoea, and breath work by using gravity. Monitor vital signs, arterial blood gases (ABGs), and pulse oximetry to detect / prevent hypoxemia. Rationale: increased PaCO2 indicates impending respiratory failure during asthmatic. Tachycardia, dysrhythmias, and changes in BP may indicate systemic hypoxemia effects on cardiac function. Provide supplemental oxygen according to the provisions / requirements. Monitor patients closely for carbon dioxide narcosis due to oxygen is danger of oxygen therapy in patients with chronic lung disease. Rationale: Occurrence / respiratory failure that would require effort dating lifesaving action. Supplemental oxygen administration can fix / prevent worsening hypoxia. Motivation exercise appropriate physical condition of the patient. Ineffective breathing pattern related to tracheobronchial obstruction. Repairing or maintaining a normal breathing pattern. Patients achieving lung function maximum. Patients showed an effective respiratory frequency with the frequency and depth within the normal range and lungs clear / clean. Patients free of dyspnea, cyanosis, or other signs of respiratory distress. Provide position Fowler or semi-Fowler. Rationale: Position Fowler / semi-Fowler enables lung expansion and ease breathing. Changing position and ambulation improve air charging different lung segments which improves gas diffusion. Teach deep breathing techniques, and or lip breathing or diaphragmatic breathingabdominal exercises when indicated and effective cough. Rationale: to help spending sputum. Observation vital signs (RR or frequency per minute). Rationale: Tachycardia, dysrhythmias, and changes in BP may indicate the effect of systemic hypoxemia pad cardiac function.